George Jaime attends the first day of his trial in Aroostook County Superior County in Houlton on Tuesday. Jaime is charged in the death of Starlette Vining, who was 38 years old when she last was seen alive in the fall of 1998 in the Presque Isle area. 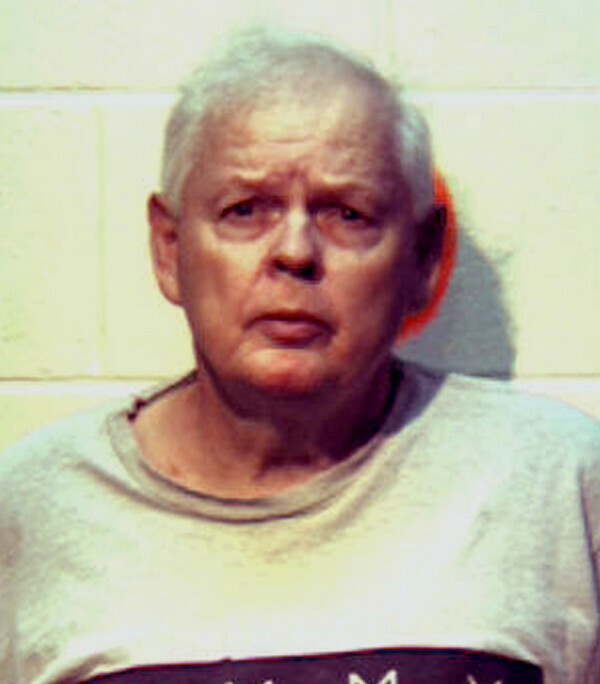 HOULTON, Maine — Prosecutors told a jury Tuesday that a former Presque Isle pawn shop owner stabbed and beat his girlfriend to death 14 years ago after a fight over a male neighbor and that one of his sons and a friend then helped clean up the murder scene. George Jaime Sr.’s son Theodore “Ted” Jaime, 44, also told the jury that a short time after he helped clean up the murder scene, he and his father went for a ride and his father disposed of a large can of ashes that he said held the remains of 38-year-old Starlette Vining. 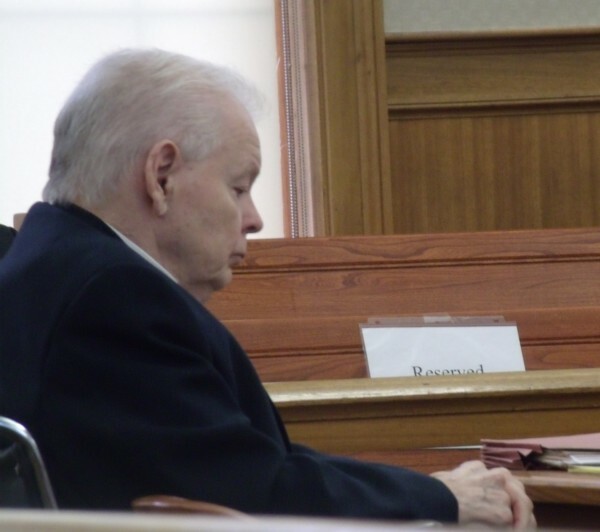 The 76-year-old man’s trial on a charge of intentional or knowing murder in the death of Vining, of Presque Isle, who has been missing since 1998, began Tuesday in Aroostook County Superior Court. Assistant Attorney General Andrew Benson, who is prosecuting the case before Justice Robert Murray, told jurors in opening statements Tuesday that Jaime and Vining had a “rocky, toxic” relationship during their brief period of dating. In the fall of 1998, Benson said, the couple began arguing over a male neighbor who lived across the street from Jaime’s pawn shop and apartment building, which led to a fight and then to Jaime killing Vining in a rage. The two then went to George Jaime’s apartment on Main Street and Ted Jaime said that he opened the door and found Vining’s body inside, with numerous stab wounds and covered with blood. The younger Jaime said that he covered the body with a blanket and again tried to get his father to explain what happened, but he would not. Ted Jaime later testified that he enlisted a lifelong friend to help clean up the scene, ripping up rugs and replacing tiles because he didn’t want to see his father go to jail. The younger Jaime told Benson that his father later did tell him that he had murdered Vining with a Marine style K-Bar knife that he later pawned at his shop, and that his father put the body in the basement of his pawn shop wrapped in a blanket and tarp while he was off trying to summon a friend to help him clean up the scene. Defense attorney Jeffrey Silverstein of Bangor argued during his opening statement that there is no body to prove that Vining is dead, that she has a history of living an itinerant lifestyle, and that some of the people who will testify are doing so because they have something to gain from it. Silverstein also challenged Ted Jaime’s testimony and veracity, and had several contentious exchanges with the witness. Silverstein got Ted Jaime to admit to having used drugs in the past, including having smoked marijuana with Vining. The defense attorney also pointed out that Ted Jaime had served time for assaulting a woman and said he was testifying against his father because of personal friction between the two. One witness on Tuesday, Frederick Donatelli Jr., a former Presque Isle resident who now lives in Houlton, testified that he once rented an apartment from Jaime and was friends with Vining. He said that once he moved to a new apartment, Vining sometimes would visit him. He told Benson that Jaime once came into his apartment and pushed him out of the way to “drag” Vining out. Donatelli added that after he stopped seeing Vining around town, he asked Jaime if he had seen her. “He told me, ‘You’ll never see her around here again,’” Donatelli told Benson. Since his arrest, George Jaime has been held without bail at the Aroostook County Jail in Houlton. Ted Jaime has not been charged with a crime in connection with the Vining case. Vining’s former husband and her three now-adult children told police that they had last seen her in 1998. Maine State Police Detective Josh Haines has said previously that family members reported her missing in October 2006. Explaining the delay in reporting her missing, the detective said that the family was not close and Vining tended to relocate often. She did not always keep in touch with her family, but she never was out of their lives for more than a few years at a time, he said. George Jaime was arrested on July 12, 2012, at the pawn shop he operated on Main Street in Presque Isle. Though her body has not been found, Jaime was charged in the death of Vining, who was 38 years old when she last was seen alive in the fall of 1998 in the Presque Isle area. The jury for Jaime ’s trial was selected over two days last week.